Park Cities Pools, provides Highland Park Pool Service, University Park Pool Service, Preston Hollow Pool Service, Lakewood Pool Service - including Pool Service M Streets - and Kessler Park Pool Service. We are a Premier Dallas Pool Service and Dallas Pool Repair company. Of all the Dallas Pool Companies, we feel that, in our neighborhoods, no other Dallas Pool Service or Dallas Pool Repair company will offer you Pool Cleaning Service or Pool Repairs as timely as we are able to. For all of your Dallas Pool Maintenance needs, know that you can call on us and we will be there, faster than any other Pool Service in Dallas. 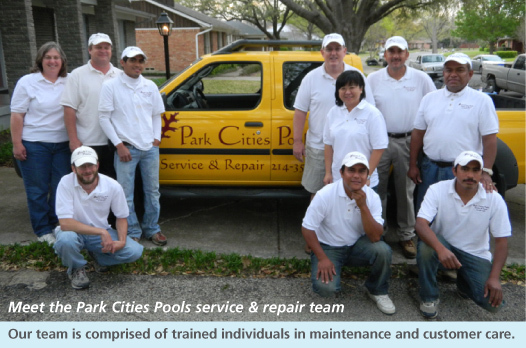 So, whether it's Dallas Pool Maintenance, Pool Repair, or Pool Service in Dallas, call the professionals at Park Cities Pools. We're not like other Dallas Pool Companies, spread all over and spread too thin. We are always In Your Neighborhood. Remember; for the best Pool Service in Dallas, call Park Cities Pools.